Recently, I shared my struggle with debt and my new resolution to demolish it. I warned you then that I have a lot to say on the subject of debt freedom, and that I wanted to do a series. Well...here it is! Personal finance is something I'm becoming increasingly, intensely passionate about. And now that my husband and I are determined to become debt free, I'm ready to document our progress along the way right here. (Finance Fridays may become a thing.) I want to get things rolling with a discussion of the rules and methods we'll be implementing on the road to becoming debt free. But also, to keep in line with the focus of the blog, I want to eventually explore various avenues of living life- really living- on a cash-only budget. I'm getting excited just thinking about how thrillingly challenging that will be. But first things first. Today, I'm talking about making a budget. The dreaded b-word. The first step, and probably the most depressing step, of gaining control over your financial situation. Now before I really get going here, I should say that none of this is new. The bulk of what I'm about to go over is common sense, and most of the rest I got from reading and listening to Dave Ramsey. I'm only sharing how my husband and I are using Ramsey's advice and common sense to take action. With that little disclaimer out of the way, let's continue. The whole point of making a budget is to determine how much you can realistically afford to spend on the things you normally put your money toward. Therefore, the most obvious place to start is figuring out how much money you have to work with on a monthly basis. That means digging out your paycheck stubs and doing a little math. You could just use a plain ol' notebook and pen (er, probably need a pencil, for readjusting things), but since I have a certain fondness for Excel spreadsheets, we organized our information there. Be sure to list everyone who contributes to the household income and, by all means, make sure you are basing your calculations on your take-home pay. Don't let your salary fool you into thinking you're richer than you are. $20,000 a year before taxes and social security and all that business may only equal $17,000 a year in your hands to budget. You need to know how much money you actually have to spend each month. Now it's time to dig out all of your bill statements to see exactly what your fixed expenses are. 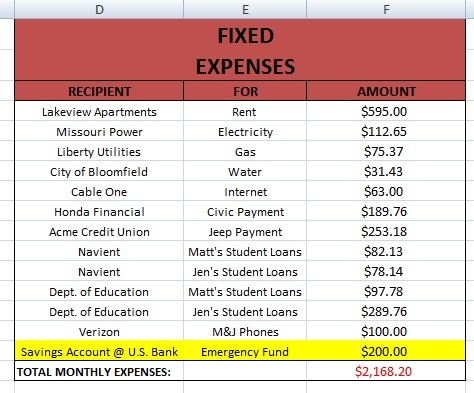 Fixed expenses are the expenditures that aren't going anywhere and can't be drastically reduced at your discretion. Like rent. If you're paying $600 a month for rent, you can't simply cut it down to $550 to save money. It'll be $600 a month as long as you're living in a $600 a month rental home. As you can see, this does not include things like groceries, dining out, gas, or clothing. Those are not fixed expenses, because you can always spend more or less each month on those categories depending on the budget you create. Before you can decide how much you can spend on those things, you have to see how much you're spending on the bills you can't get rid of. Technically, the amount you put into savings each month is an adjustable expense. However, to ensure that we're depositing the same amount into our savings account each month, we chose to include it as a fixed expense. If you go ahead and plan to pay yourself first as a fixed expense, you won't be tempted to cut it out when you're shaping the rest of your budget. Now for the depressing fun part. 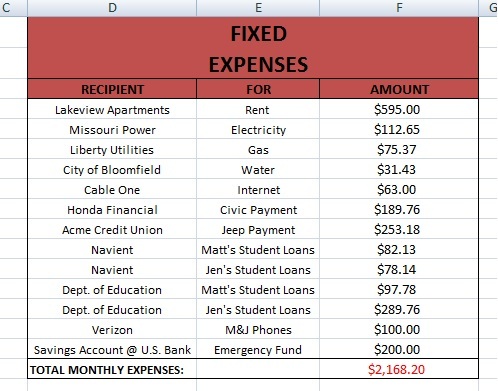 Subtract your fixed expenses from your total income to see how much you have left to live on. According to this, after we pay our bills, we should have around $1113.58 leftover in our bank account each month to work with. 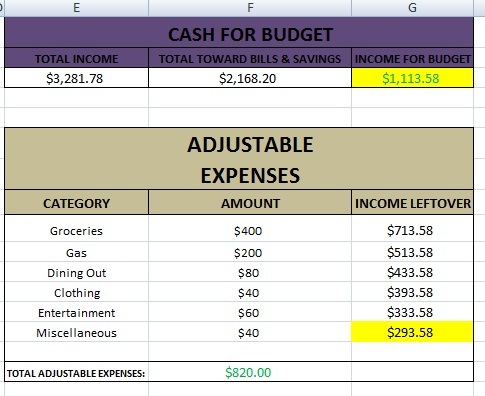 Let's go from there to outline our adjustable expenses. You'll need to make up a few categories to guide your spending. Since all of us have different needs and priorities, these categories and the amounts we choose to allocate to them will differ drastically from one individual/family to the next. The categories Matt and I have created for our budget are: groceries, gas, dining out, clothing (just in case), entertainment (like a new CD or a trip to the movies), and miscellaneous (any unexpected costs that don't require dipping into our emergency savings account). If you tend to spend a lot of money on a particular hobby (one you're just not willing to give up for your budget's sake), like scrap booking or golfing, you might want to create a category specifically for that hobby. If you have a medical condition that flares up from time to time and requires irregular medication or doctor's visits, you should consider creating a medical expense category. It's really up to you and your wants and needs. Like the words "adjustable expenses" indicate, the amounts in these categories can be adjusted until you find a number that works comfortably for you. Your family of four might need to spend $500 on groceries. You may be a single chef who cooks all your meals at home; you may put only $10 in your dining out category, if that much. If you're lost or just don't have any idea how much you should allocate to a category, wait a month or two before you outline your budget. During this one or two month period, spend as you normally do, but keep your receipts. List out your categories on a spreadsheet or a piece of notebook paper and log your purchases. Then, at the end of the month, see how much you spent on each category. This will show you where your money goes, and that will help you decide where you need to expand or cut back when you're writing out your budget. Whatever numbers and categories you designate, the ultimate goal here is to make sure your Income For Budget ($1,113.58 in the spreadsheet above) can be divided among the categories comfortably with a decent chunk leftover at the end of it all that you can use to improve your finances. The Income Leftover ($293.58 above) is this chunk, and it needs to go one of two places: 1) into savings, or 2) towards your debt. This will be the extra money you can put toward your debt each month (on top of the minimum payment that's already listed in your fixed expenses) that helps dig you out of the hole. That's pretty much it. You'll need to keep up with your receipts and log your expenses to make sure you're staying on track, and of course, you'll probably have to play around with the numbers for the first few months to see how much you'll spend in reality. But this is an excellent place to start. Next up in the series on debt freedom, I'll discuss the Cash Envelope System and how we've made it work for us. It goes hand-in-hand with the budget categories listed above, so if you're interested in budgeting, be sure to stay tuned for that! 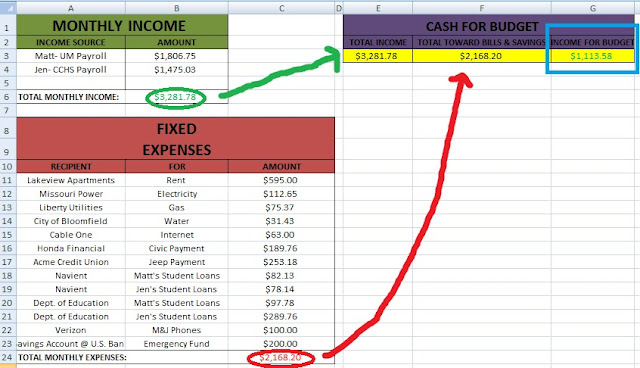 Also, if you really want to follow the steps I just listed, you can click here to download a blank version of the Excel spreadsheet I used to set up my budget. I hope it can be of some help! 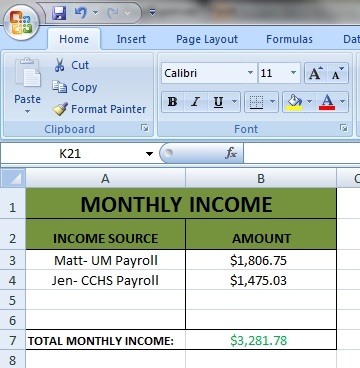 As a fellow Excel lover, this post made me so happy! Lol. 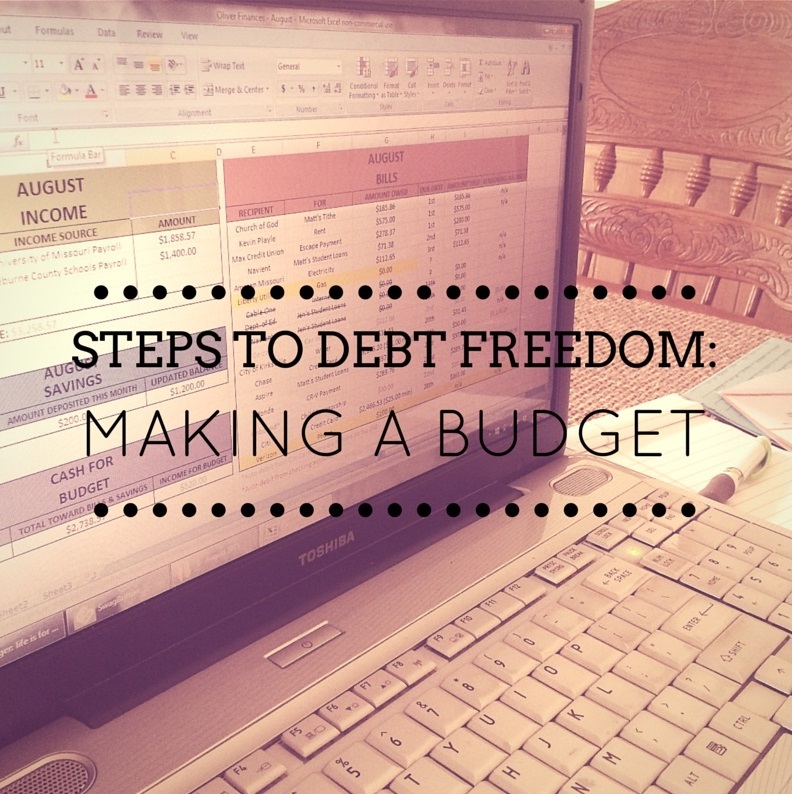 You say budget writing is a dreaded step, but I totally nerd out and love creating my budget. STICKING to my budget is a bit more of a bummer, haha, but keeping a budget has always opened my eyes to how much money I waste. I am constantly updating my budget to be more reasonable and trying to save more and more each month. Your post gave me some ideas on how to fine-tune my budget even more though (for instance, I never budget for dining out--when I do dine out that money comes from my "entertainment" account, but I'd like to have it broken out even more so I know exactly what I'm spending on what).